With the release of the new Hercules:Thracian wars we are still wondering who Dwayne Johnson will play in the DC universe. Time and time again we are teased. He commits to saying in this interview by Total Film that it won’t be John Stewart, The Green Lantern, largely because the portrayal has already been done. We wrote about this in march . He teases that an announcement is forthcoming. 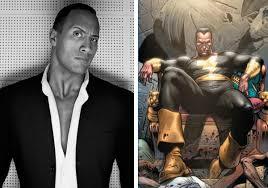 His mention of a “Word” leads us to believe that its Shazam but I hope that its Black Adam. My reasoning is that the best movies are the ones where the villian is done well. When the bad guy is lame then the movie can fall flat. We have to really buy in to the idea that the villian is a worthy adversary.